St. Joseph's Church in Nechells. St. Joseph, the husband of Mary, our Blessed Mother, and foster father of our Divine Lord Jesus, is patron of our parish and school. In 1850, the present sanctuary of the church was designed by Pugin as a mortuary chapel for the new four-acre cemetery surrounding the existing church. It was at this time that origin of this caring parish began, firstly by burying the dead and caring for the grieving families. 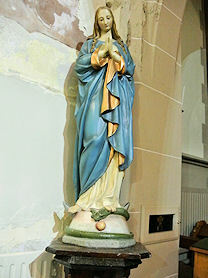 The parish which began as a new mission soon realised the need to care for the children of the parents that were moving into the area, particularly the families fleeing Ireland at the time of the great famine and after. The early parish community was caring, hardworking and co-operative. 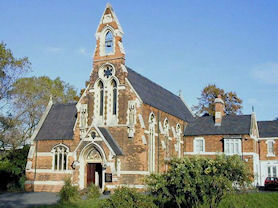 The Parish Priest, Father (later Canon) Greaney, opened a new school in 1868. This came about through the hard work and co-operation of parishioners working under the leadership of Messrs. Smallwood and Rigby. In 1867, they handed over the sum of £115/7/6 to the newly appointed Parish Priest, together with a plan for a small school building. Fifty pupils were enrolled in the school, which opened on 7th July 1868. Management and staff for the school were sought from the Sisters of Charity of St. Paul and Mother Regis became the first Head Mistress of the newly founded school. Many developments took place in the following year, leading to the establishment of separate girls and boys' schools. Since this time we have always strived to follow the ways of Jesus. Parents are the first educators of their children in the ways of faith, though their example of what they say and do in Christ Jesus our Lord. This is affirmed through the rite of Baptism for children. 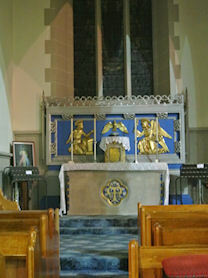 Our children and their families join the rest of our parishioners to celebrate together in the parish at 6.00pm on Saturday evening, gathering around the altar, the table of the Lord.